Apple Maps in iOS 9 now grant transit options for users in a select number of cities (inlcuding Toronto, thank goodness!). However, Google isn’t sitting on their laurels in the mean time. Yesterday’s Google Maps update added a number of interesting features, including direct sharing to Facebook and Facebook Messenger (great for events and friends who are showing up late). However, the most useful feature for me has been the addition of live transit schedules built right into the app. It’s now easier to identify different kinds of routes, and these routes are differentiated the moment you request transit directions. 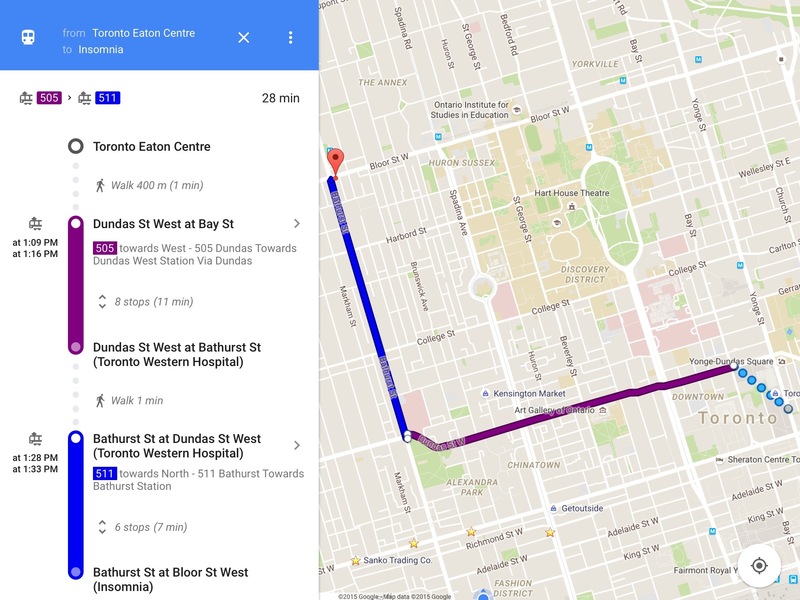 I tested a few different locations and Google would divide its suggestions into Fastest, More by subway, and More by tram. Tapping on a particular line (e.g. 501 on Queen) displays the upcoming arrival times, so you can check to see how much leeway you have in case you miss the first streetcar or bus. Google Maps has had transit directions for quite a while now, but it’s nice to see the UI has been cleaned up and now offers more granular detail. Apple Maps still seems to have an advantage in Canada due to the mapping of specific station exits, but this update from Google Maps is running a close second. I still can’t decide whether I like Google Maps or Apple Maps better. It’s one of those rare cases where the superior app isn’t obvious.